It's an easy DIY game for kids of all ages. 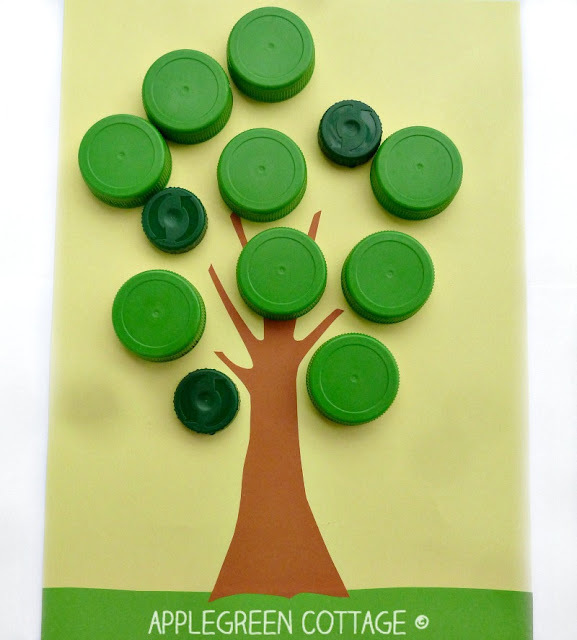 It's made using plastic bottle caps - reusing materials that you already have at home, at no cost. 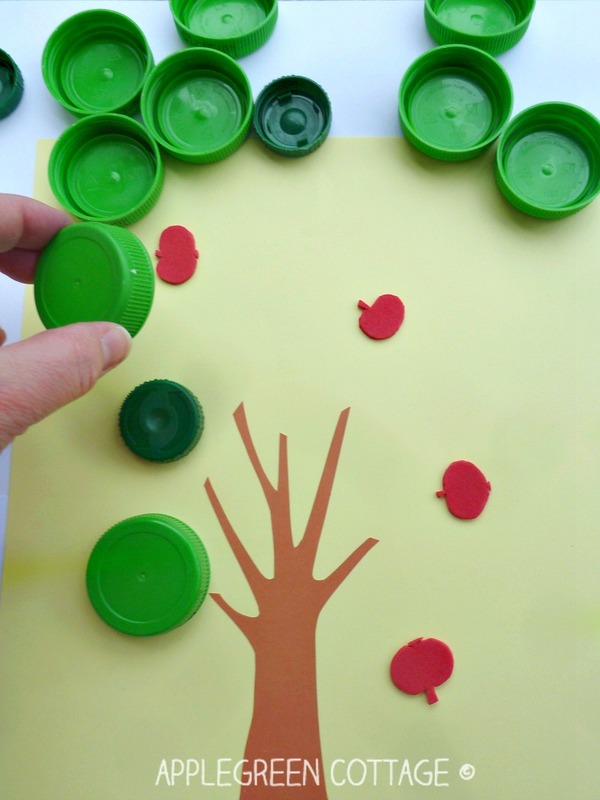 It's a colorful play with red apples and green leaves. Ready for some apple hunting fun? Have a look! We really enjoyed this engaging game, so I thought it is a good idea to spread word about it. 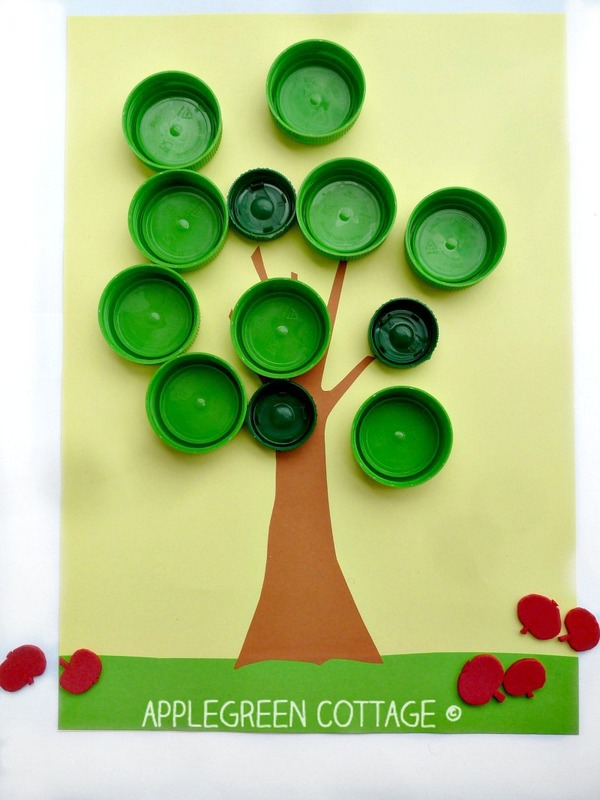 It's engaging, easy to play AND takes only little time to arrange. 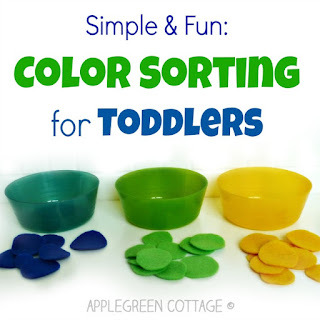 Great for preschool play! But first, I need to give credit for the idea that has given us such a great time playing: Kate at A Little Pinch of Perfect posted about a very similar game her kids played. As I see now, both the game and the setting have turned out to be a little different from hers, but the idea is definitely from her place. Thanks, Kate! Now, off we go. 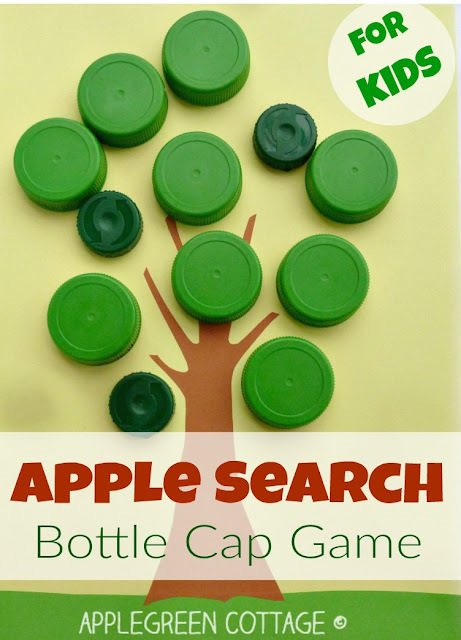 First, let me list the required materials, then the setting and then the HOW-TO directions for playing this apple search game. 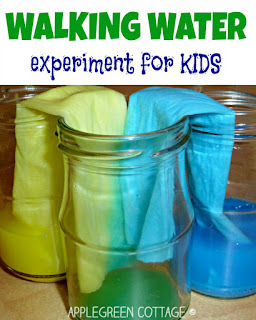 Please also note that the post includes affiliate links for your convenience, if you'd need to stock on the materials you need for this activity (but most probably, you already have everything you need). (Optional:) cut a green stripe of crafting paper to the bottom. Glue to a piece of paper. Bear in mind that only half of the bottle caps will house one 'apple', meaning that if you've got 10 caps, you'll only need to cut out 5 craft foam apples. 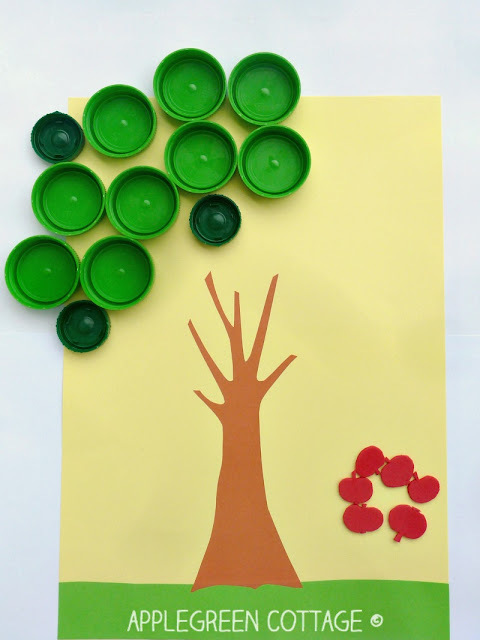 Place the red apples 'on' the tree branches. 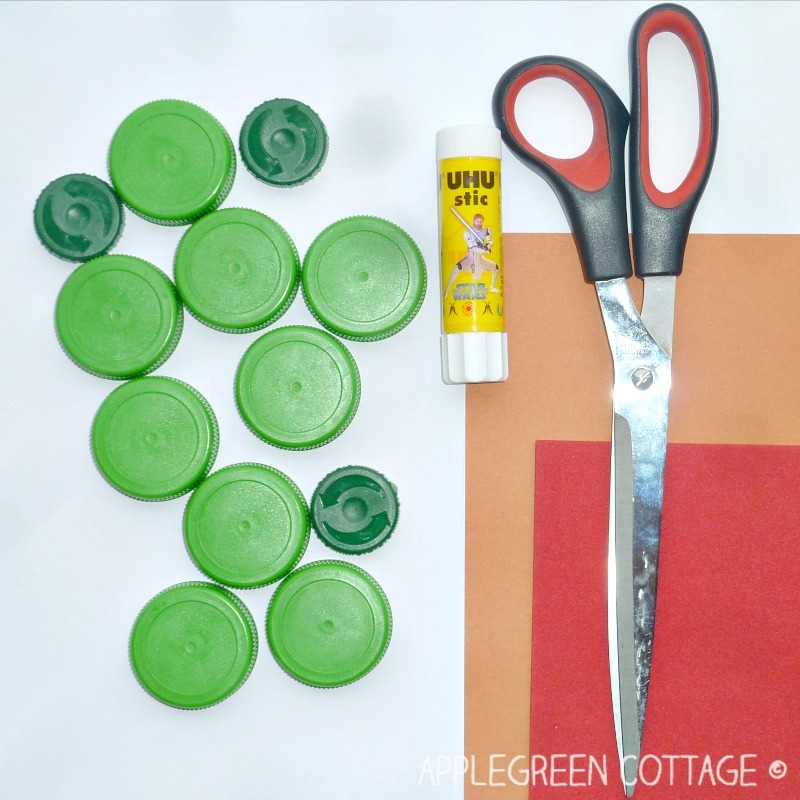 Cover the apples using green plastic bottle caps (=pretend leaves) on them, and spread the rest of the green bottle caps around these. Meaning that one half of the plastic bottle caps will be empty. The green bottle caps are leaves, and that apples are hiding under some of these leaves. Try to collect as many apples as possible by taking turns. With two players, they will take turns. Each time there is only one try. 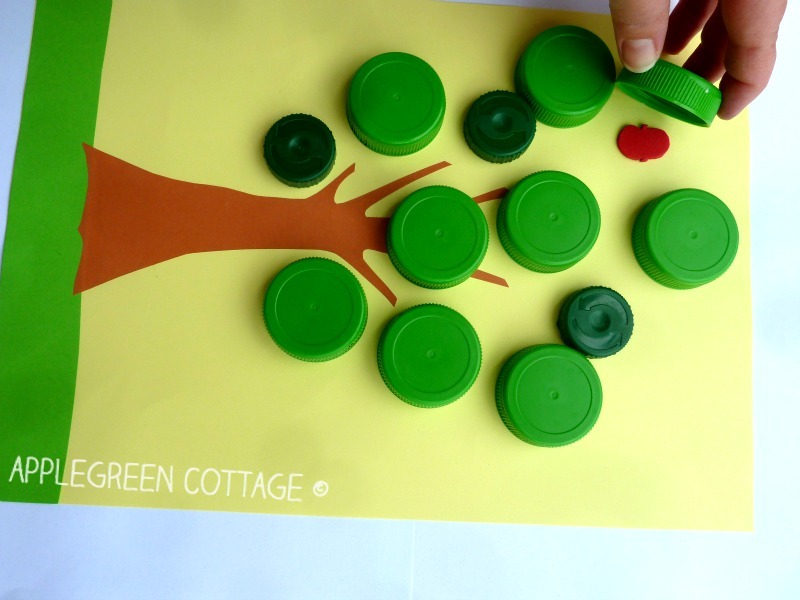 The first player chooses one 'leaf' (=one bottle cap) and lifts it to see if there is an apple hidden behind. He turns the cap upside down to mark it has been already searched for apples. If there was a red apple hidden below, he gets to keep the 'apple'. If not, he stays empty-handed in this turn. Then, it's the second player's turn to guess. They play as long as there are still untouched caps available. The winner is the one who collects the most apples. It's a good activity to practice taking turns and patience. A useful life skill!! Sign up and be the first to get my new tutorials and tips. If you sign up HERE, you also get a freebie - AppleGreen Cottage subscribers get the 3 smallest sizes of my Perfect Earwarmer Headband Pattern (size baby to one year) as a free PDF. Great game! Thanks for sharing! Such a fun game. I wanted to let you know that I am featuring this on my site.